Located in Riverfront, this hotel is 0.1 mi (0.2 km) from Chase Center on the Riverfront. Wilmington Station is 18 minutes by foot. Hard to get to but Nice clean comfortable room. The staff was friendly. The check in line was crowded when we got there, there was one person working, but she was amazing! Very helpful, apologized for the wait, and was knowledgeable! She did a great job! The pool was great! Very clean! My only complaint about our stay was that the carpets in the hallway and on the stairs could have been cleaned, but that didn’t deter us from enjoying our stay. The room was clean, bathroom was clean, and breakfast was delicious! Where to find Wilmington hotels near an airport? How can I find hotels in different Wilmington neighborhoods? Where can I find hotels in Wilmington that are near tourist attractions? If you are choosing where to stay in or near Wilmington, there is a terrific assortment of comfortable possibilities. Approximately 26 places to stay are within a 0.1-kilometre (0.06-mile) radius from Wilmington's downtown area. Travelers hoping to find a hotel close to the center of Wilmington, should check out the latest deals at the Hotel du Pont and Sheraton Suites Wilmington Downtown. New Castle is an excellent hotel neighborhood in which to base yourself because it offers 6 hotels that can be booked through Expedia. New Castle is 10 kilometres (6 miles) from the center of Wilmington. 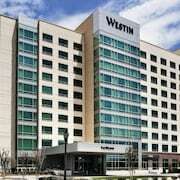 Choose from a number of hotel establishments such as the Sheraton Wilmington South Hotel and Clarion Hotel The Belle. Tourists will also find some comfortable accommodation in Newark. This neighborhood is 19 kilometres (12 miles) from downtown. Newark's better known hotels include the Homewood Suites by Hilton Newark-Wilmington South and Courtyard by Marriott Newark-University of Delaware. Another option is to stay in Christiana, which is where you'll find the Staybridge Suites Wilmington-Newark and Residence Inn by Marriott Wilmington Newark/Christiana, or Wilmington Riverfront, home to the The Westin Wilmington and Luxiasuites Justison Landing. Yorkshire is 20 kilometres (12 miles) from Wilmington's downtown, while Talleyville is 7 kilometres (4 miles) from the heart of Wilmington. 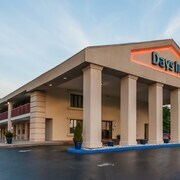 The Embassy Suites Newark - Wilmington/South and Baymont Inn & Suites Newark at University of Delaware can be found in Yorkshire, while Homewood Suites by Hilton WilmingtonBrandywine Valley and Courtyard by Marriott Wilmington Brandywine are located in Talleyville. Thrifty travelers rejoice! The Wilmington area provides a good selection of lower-priced options. 15 kilometres (9 miles) from Wilmington's center is where you'll find the Best Western Plus Newark/Christiana Inn. 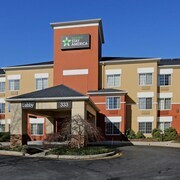 The Extended Stay America - Newark - Christiana - Wilmington is only 12 kilometres (7 miles) away. Some more Wilmington hotels in the cheaper range are the Ramada Newark/Wilmington and the Quality Inn And Suites Skyways. The Pennsbury Inn can be found 16 kilometres (10 miles) from the heart of Wilmington. Or, alternatively, the Fairville Inn is positioned 13 kilometres (8 miles) away. More hotel options worth looking into are the Faunbrook Bed & Breakfast and the Courtyard Philadelphia Springfield. 0.3 kilometres (0.2 miles) away from Wilmington you'll find Downtown Wilmington, where you can spend the day exploring World Cafe Live at the Queen and Saint Anthony of Padua Church. Some of our recommended Downtown Wilmington hotels and accommodations include the Courtyard by Marriott Wilmington Downtown and DoubleTree by Hilton Downtown Wilmington - Legal District. 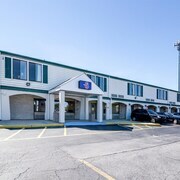 Alternatively, you could consider staying at Dover, 65 kilometres (41 miles) to the south of Wilmington, where you can pick from the Dover Downs Hotel & Casino and Residence Inn Marriott Dover. While in Dover, don't miss the Delaware State University and Dover Downs Casino. Philadelphia International Airport can be found 30 kilometres (19 miles) from Wilmington. Visitors who choose to stay nearby, you can book a room at the Philadelphia Airport Marriott or the Embassy Suites Philadelphia - Airport. What are the most popular Wilmington hotels? Are there hotels in other cities near Wilmington? What other types of accommodations are available in Wilmington? Explore Wilmington with Expedia.ca’s Travel Guides to find the best flights, cars, holiday packages and more!